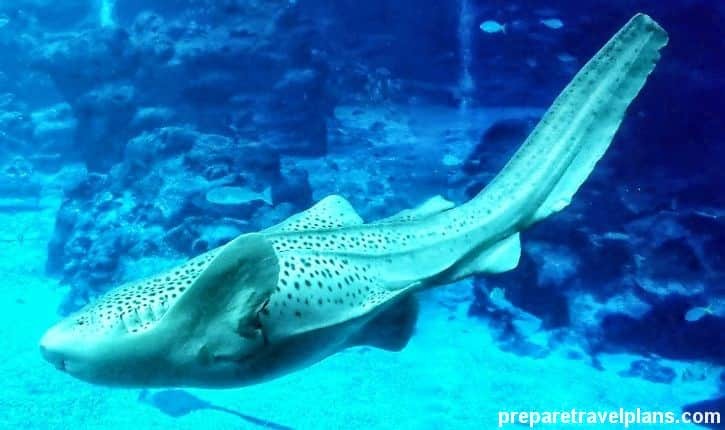 Eyeing to visit the underwater world in Sentosa, Singapore? This S.E.A. 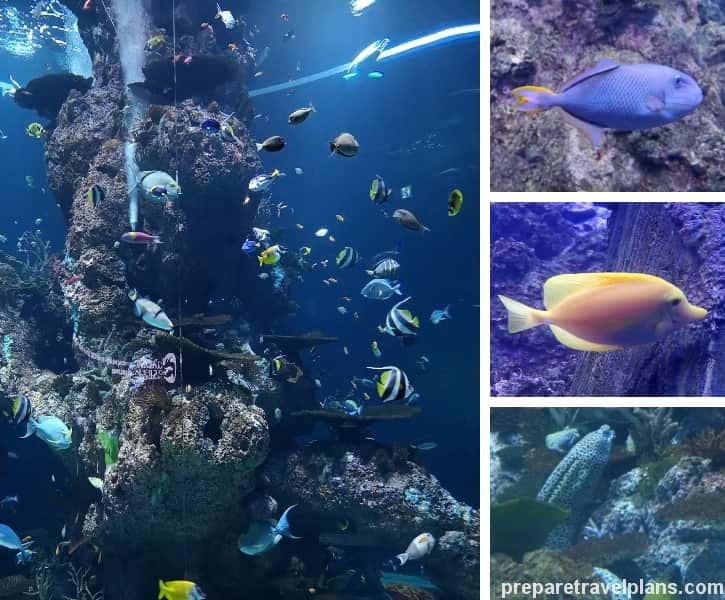 Aquarium Singapore reviews help you on what things to do and see at Sentosa Aquarium. 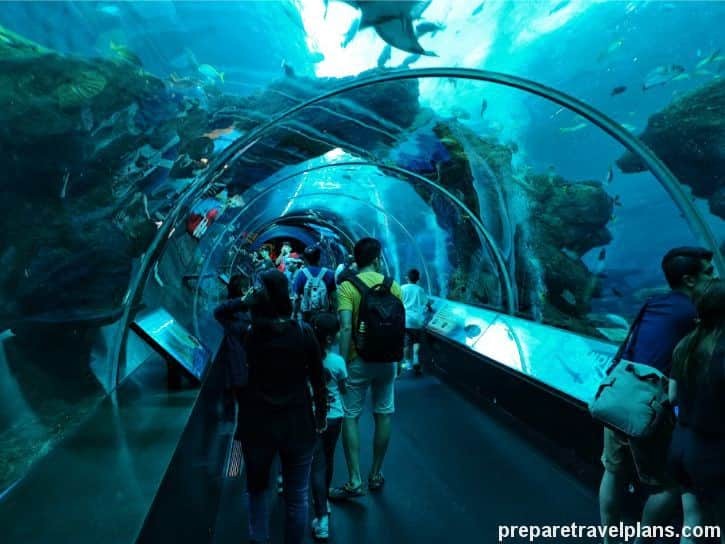 Dubbed as the largest oceanarium in the world, Southeast Asia (S.E.A) Aquarium is one of Singapore’s most-visited and recognized leisure spots. How do I get to the S.E.A. Aquarium in Sentosa Island? Don’t worry, here is the comprehensive guide to teach you go to S.E.A. Aquarium Singapore by MRT Train. S.E.A. 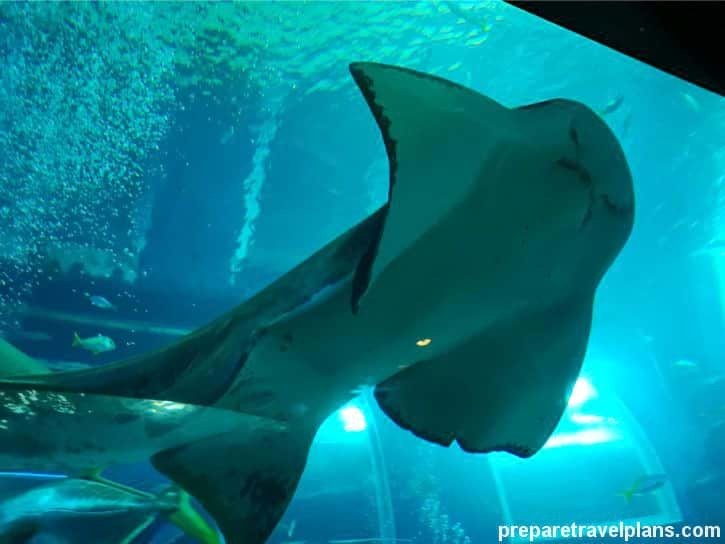 Aquarium Singapore Map and How Long You Need to Spend at There? What Things to Do and See at S.E.A. Aquarium Singapore? The S.E.A. Aquarium itself is a charm like no other. 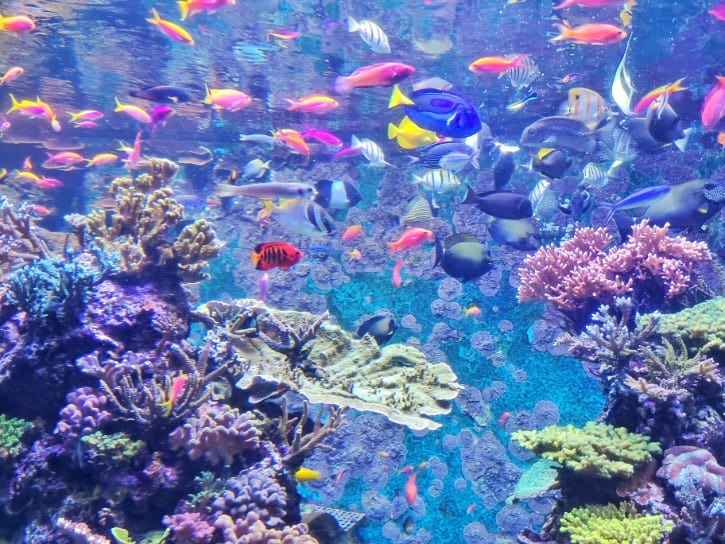 It houses the most stunning sights of marine attraction―from vibrant corals to various fish species. 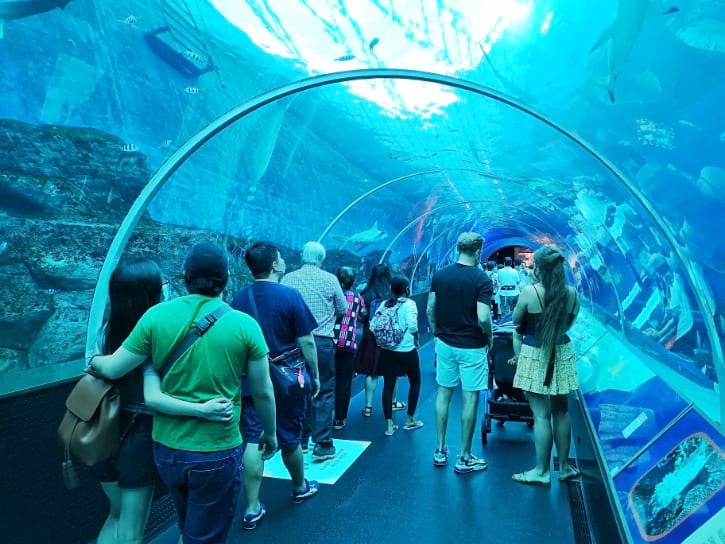 A walk around the enormous underwater world in Singapore is a pleasing excursion that will take three, worthwhile hours. Once you enter the premises, you might get intimidated with the abundance of attractions. Better yet, get a free S.E.A. Aquarium Singapore Map at the brochure display rack near the entry gate. This map will guide you navigate the aquarium efficiently and effectively. You can also download the S.E.A. Aquarium Singapore Map. So, it’s high time for you to prepare your S.E.A. Aquarium tour and make it one for the books! First things first, this destination fits those who are searching for marine life entertainment and education at the same time. 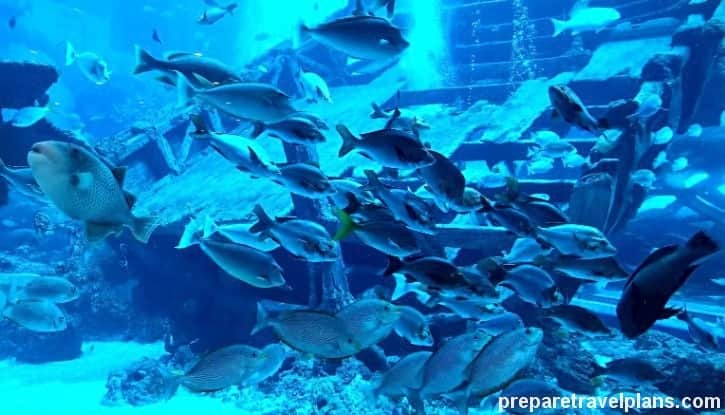 But you need to prepare yourself with what lies ahead―over the 100,000 sea creatures treading along the waters! Yep, the S.E.A. Aquarium is too big of a place to be staying around in one area. Explore the entire destination and get enthralled by each sea animal! After all, you’re inside the world’s largest aquarium, so might as well make your stay worthwhile and fun. Let’s get this virtual tour started and fuel your excitement to the fullest! There are around 50 habitats speckled within this magical aquarium. Each habitat shelters a multitude of unique species that are all impressive. Lots of valuable information and insights are plastered on the huge exhibits so that you’ll learn while gazing at the marine abundance. In addition to that, there are lots of different zones which classify the sea inhabitants. Uncover every habitat and share an intimate moment with your favorites! Take your time in the Shark Seas Habitat and learn more about these scary yet highly inquisitive sea creatures! Different exhibits of shark information, protection, and conservation are showcased along the area. 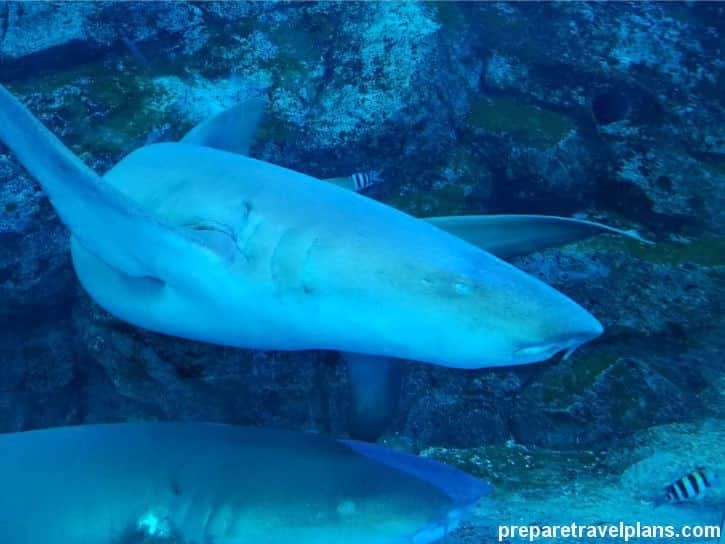 In this place, you can witness some of the wildest sea predators like the Nurse Shark and the Hammerhead Shark. Together with a friend or family, witnessing different water animals feed on their prey is the best way to learn about their interesting nature. These hunters have a wide selection of food to choose from, depending on what kind of species and environment they belong to. Fortunately, the sharks on display do not feed on humans, contrary to the common misconception! It’s true though that fishes and other smaller sharks are some of the sharks’ usual preys. With its sharp 360-degree vision, the Hammerhead Shark might share with you some intimate stare through the glass. Just don’t freak out and enjoy the moment! 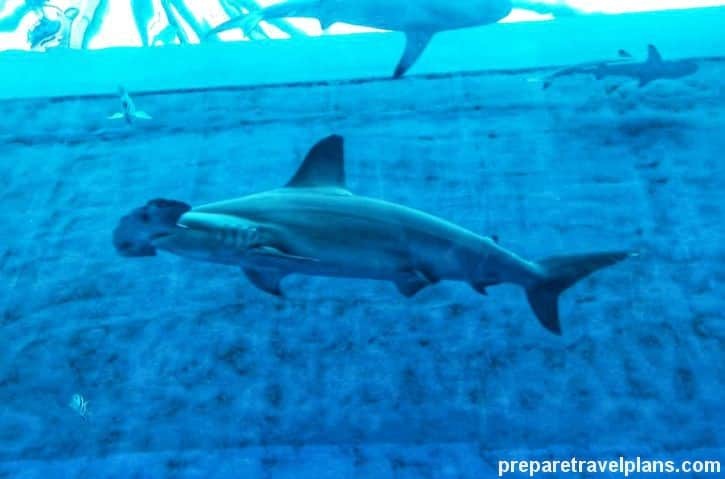 And, if you are searching for a closer and more daring experience with them, you can give the Shark Encounter a try. It’s a bold chance to go face-to-face with some of the ocean’s largest creatures. This is one of the special experiences offered in the aquarium, so take this chance to be with some of the ocean’s biggest predators. 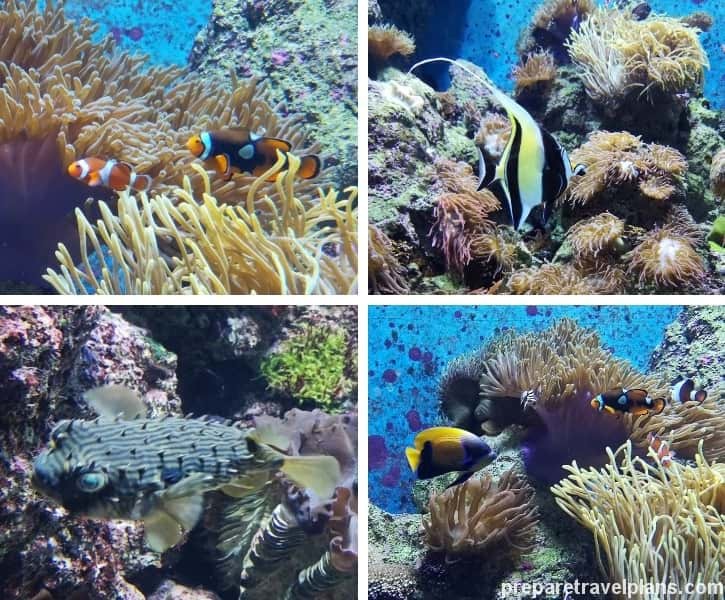 Be captivated with the vibrancy of coral reefs and the abundance of colorful fishes. These reefs are even more enlivened by the sight of fishes going to and from their way. Here, you won’t have a hard time spotting the iconic dory look-alike with the swarm of Blue Tang in the reefs. 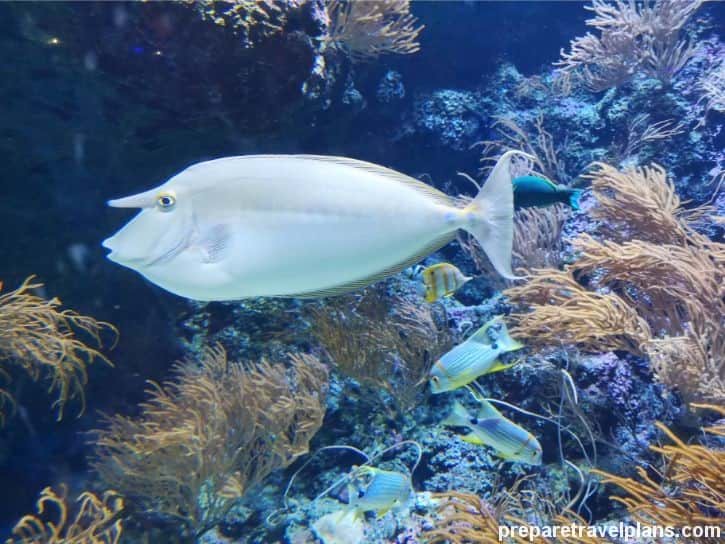 The spawn of Unicornfish and White-Barred Boxfish also make the habitat more exciting! 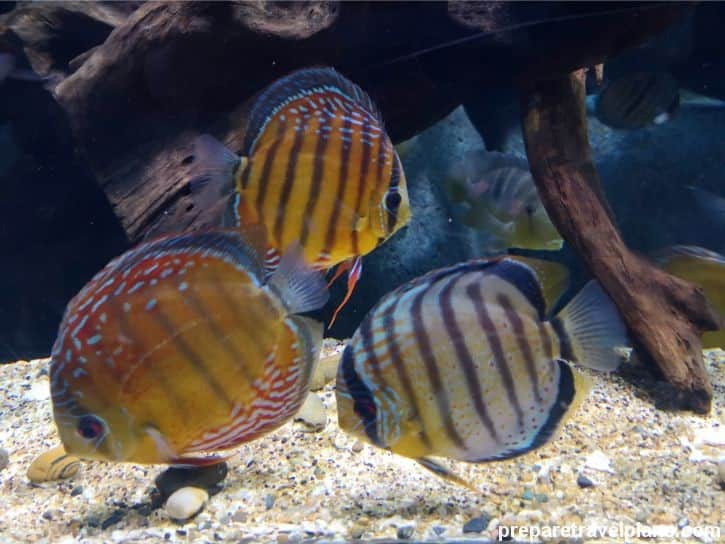 Among others, you can also share glances with the likes of the Mauritius Triggerfish, Globefish, and Surgeonfish. To give you a glimpse of the breathtaking Live Coral Habitat, check out the video below. The habitat’s replication of a natural rainforest environment will make you feel as though you are plunged into a real tropical rainforest! Feast your eyes with the contrast of fishes tailing by, and bless your ears with the relaxing freshwater vibes. Altogether you will hear the flow of water, the movement of the leaves, and the sound of the sea creatures! 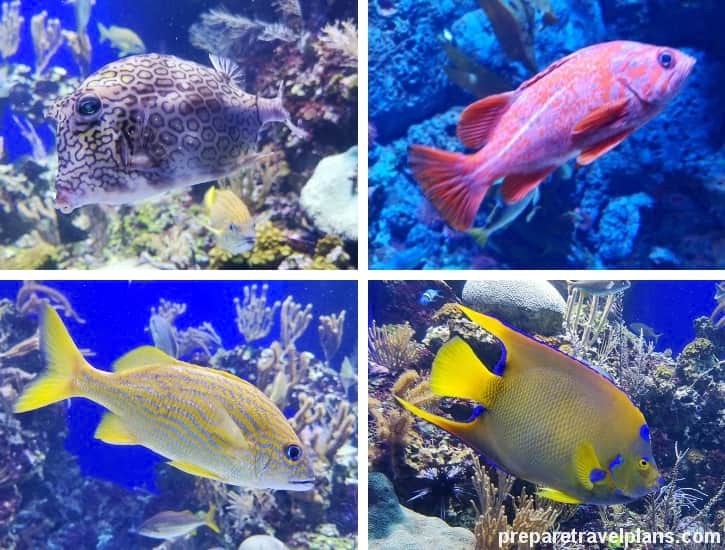 Joining them are the Spanish Flag, Vermilion Rockfish, Whitespotted Filefish, Discus Fish, Angelfish, and the Honeycomb Cowfish. These fish species move freely in their habitat, making the whole ambiance, with its beautiful rock formations, a beautiful sight to enjoy. 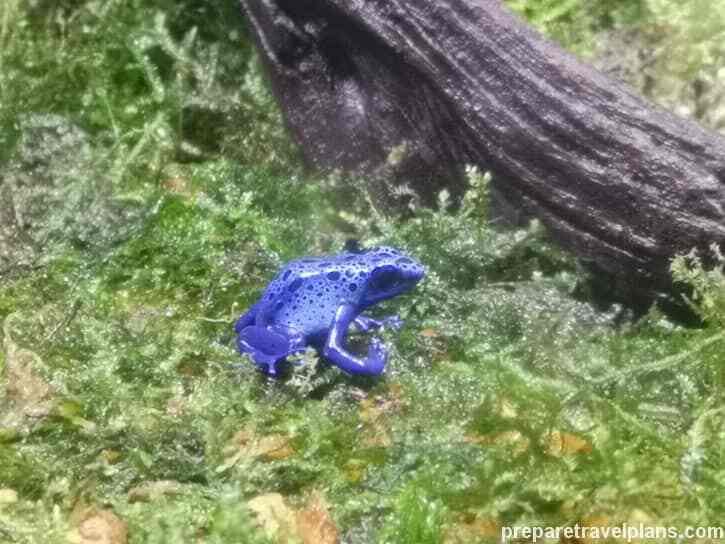 Better yet, don’t miss spying on the lethal Blue Poison Arrow Frog! Tiny they may be, but they’re considered as the most poisonous animals of the aquarium. Even their large predators have nothing on their lethality! 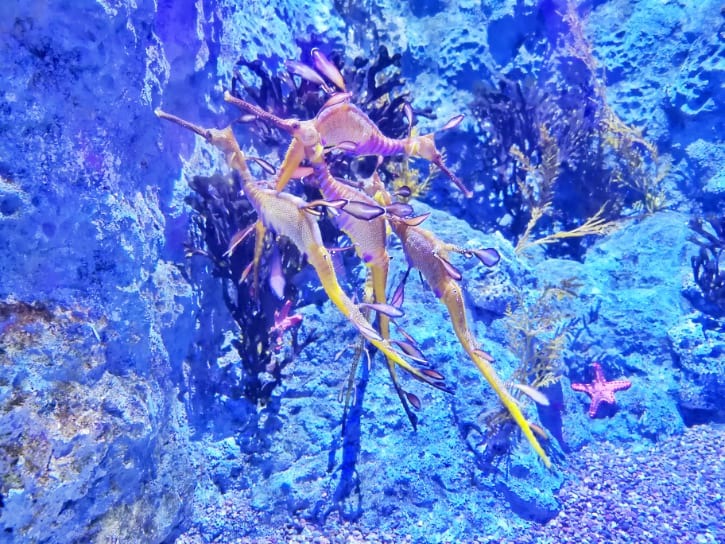 Sea Dragons are among the most unique and interesting marine creatures in the aquarium. These fascinating sea animals love to play hide and seek. Discovering them might get really tricky since they usually camouflage using their leaf-like built. Their intricate structure allows them to blend easily. However, you can usually track them in leafy and sandy areas. Just make sure to keep your eyes on focused and steady! Welcome to the dwelling of the ocean’s giants! Residing here are the Giant Manta Ray, Goliath Grouper, Zebra Shark, Reef Manta Ray, Yellow-banded Sweetlips, and 40,000 fishes more! As you watch through the massive viewing panel, you’ll get dwarfed in no time by these enormous creatures. Weighing more than 250,000 kg and is 700mm thick, the enormous viewing panel lets you experience the most ocean-like encounter in the habitat. It’s like watching inside an IMAX theatre, but with real-life creatures. The view you can get from the panel is a total bewilderment. It provides an impressive sight of massive sea predators with clear marine movements. Examine how these sea giants mix along with the crowd of fishes of diverse 120 species! The biggest of all habitats, the Open Ocean is simply a kaleidoscopic depiction of the real aquatic life. Though there are plenty of marine creatures on display, the jellyfish exudes that dream-like feels that can’t be missed. The delicate movements of a jellyfish will put you in a slight state of hypnosis. Varying from Blue Blubber Jellyfish to Moon Jellies and Pacific Sea Nettle, what they create is an effortlessly time-stopping scene. Just don’t get too spellbound or you’ll forget the rest of the habitats! 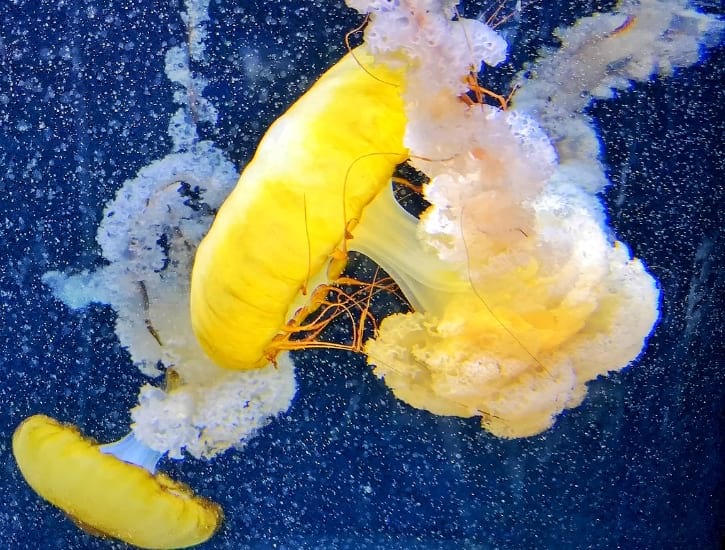 Watch the video below and be virtually mesmerized by the enthralling jellyfish movements. It’s almost impossible to let these giant crabs out of your sight. Unlike the fishes swimming around, you’ll picture these sea titans in a completely relaxed position. 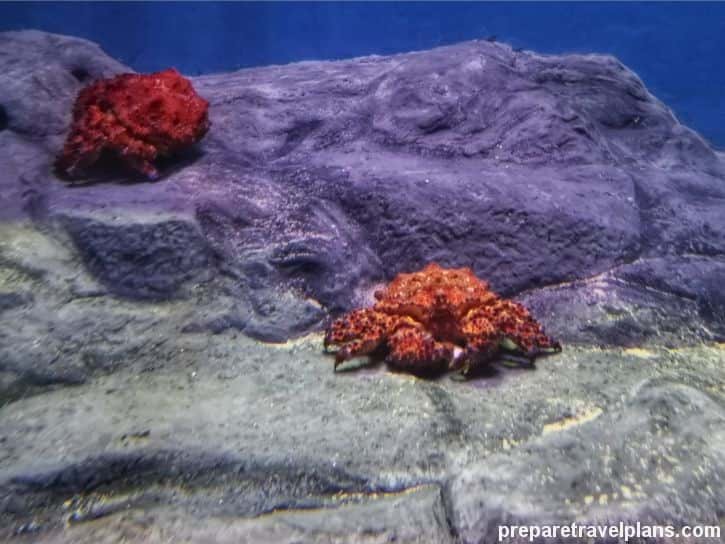 Normally, a Giant Spider Crab sits on top of the rocks along with other crabs of its kind. Once in a while, they’ll walk slowly around their habitat and may not even bat an eye when staring at you. But don’t let its ruthless structure and glare scare you―these omnivorous creatures are a lot less cold-blooded than you think. 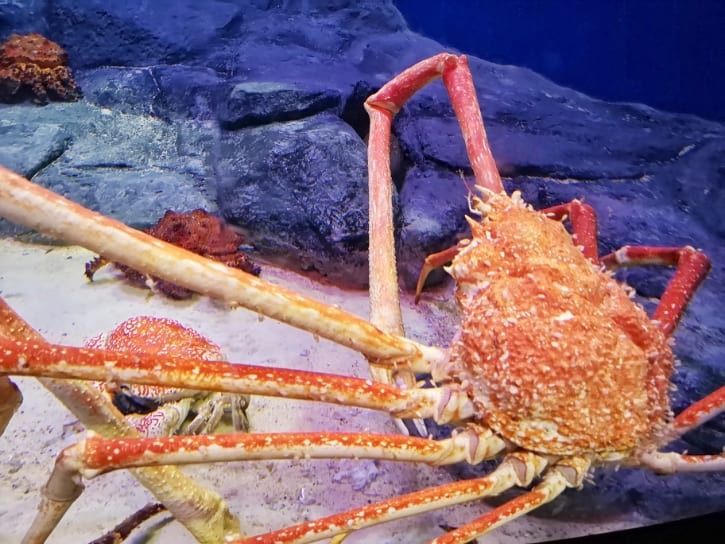 Living with the Giant Spider Crab is also the Puget Sound King Crab. Compared to the former, the Puget Sound King crabs are much smaller in size. This habitat is among the top highlights of your entire S.E.A. aquarium visit! It’s filled with a graphic manifold of fishes that swiftly pass by each other. To name them are the tiny Yellow Striped Scads and Indian Mackerel. Their petite bodies are made visibly huge when they gather by group! Once you see those charming dorsal fins, you know you’re faced with one of the most intelligent aquatic animals! The Indo-pacific Bottlenose is a smart and good-natured dolphin that will immediately win your heart. With its thin beak, slender body, and its total outgoing and friendly character, this creature is an entertaining sight to behold, especially when performing! 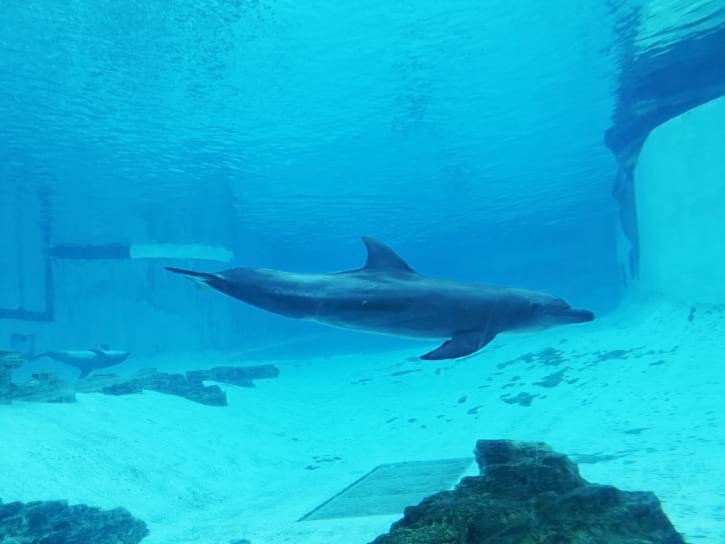 To top that, these dolphins also have incredible hearing skills. While inside the place, give a few of your sweet greetings to know they’re appreciated! 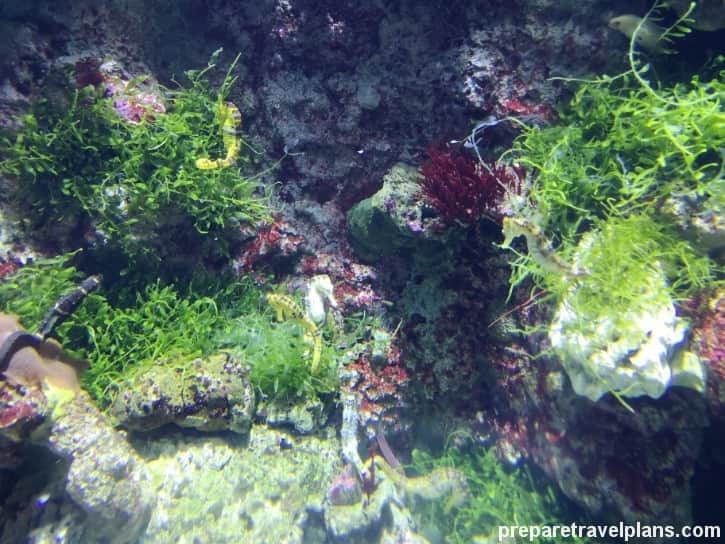 Uncover the life of corals in this habitat bursting with colors! This place will literally keep your attention busy with all the vivid coral reefs swaying in beautiful rhythm. 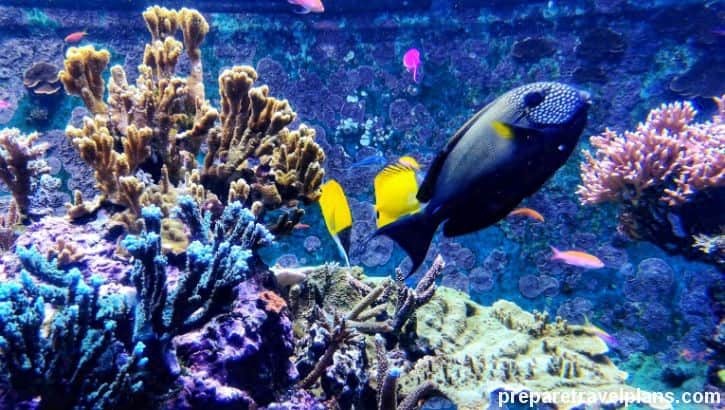 You’ll be amazed by the number of inhabitants in the reefs―more than 5,000 colorful fishes, including the likes of Majestic Angelfish, Moorish Idol, and Clownfish. With 110 species dwelling in the reefs, there’s just too much to see! It will be exactly like watching a scene from the timeless Finding Nemo film. 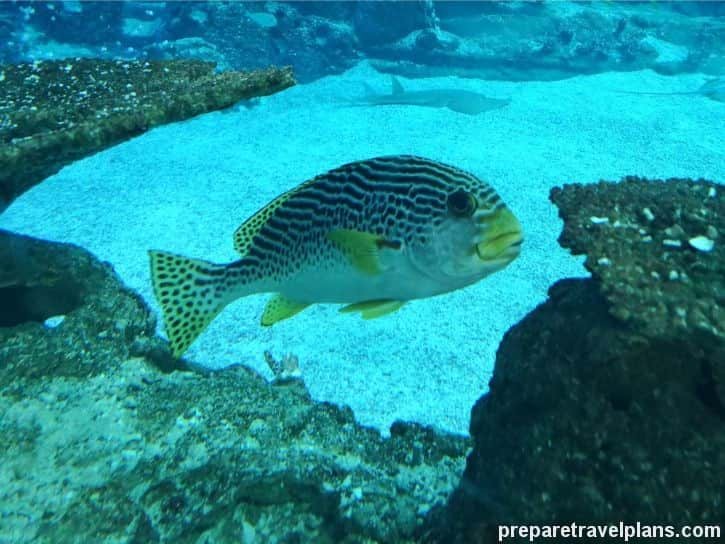 The diversity of fishes in the reefs, including the popular Pufferfish, will surely feed your love for marine life. Kids and young-at-heart adults have the opportunity to make close interactions with some adorable star-shaped creatures! In this area, sea stars are some of the cute life forms you can touch. Be patient when waiting for your turn though because loads of people are also eager to meet them. When touching them, do remember to be gentle! During the entire course of your stay at the Coral Garden Habitat, you’ll find yourself wanting to know more about every marine species. Witnessing the supple movements of the sea dragons and seahorses is enough to get you fascinated. Though these species are only a few in numbers, their distinct and colorful structure draws a lot of attention. The Leafy Seadragon and the Weedy Seadragon are two of what you can see in the oceanarium. Also guaranteed to bring you visual excitement is the Estuarine seahorse as well as the Tiger-tailed seahorse. Sure enough, it may take time to find them because of their tiny size. But spotting them will actually help you become more observant of the spectacle going on in the waters. Moreover, seahorses are petite but loyal―these creatures choose and stay with only one mate for the rest of their lives! 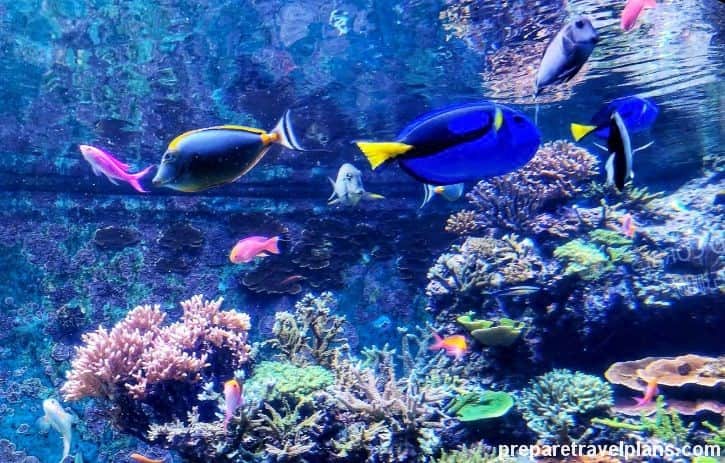 Strolling along the aquarium is almost like diving under the deepest waters—the only difference is that you’re travelling by land and not by water! In this habitat, you can find a sunken ship that serves as an abode to diverse marine creatures. These are from 800 species across the planet, which gathers in vivid, large groups. 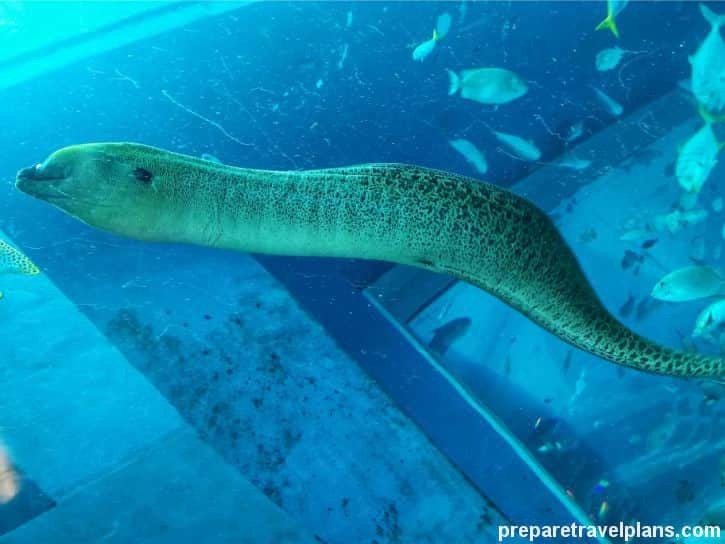 Among them, you find the rare and striking moray eels. Usually, you’ll spot most of them rising from crevices, which they consider as their hideaways. Be one of those visitors who get enveloped by their snake-like movements! Or catch them do their predating tactics using their alien jaws. Aside from the moray eels, other schools of fishes create their homes within the sunken ship. But of course, this massive aquarium takes on some adorable surprises, making it a hit for people of all ages. 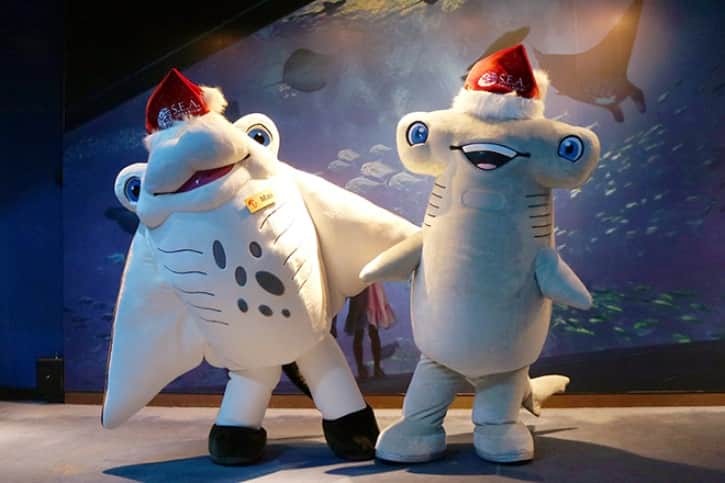 There are mascots walking around the Ocean Dome, adding more amusement to your trip! Greeting you are the bubbly Sam the Shark and the cheerful Mai the Manta Ray! They’re down to give you the warmest embrace and full-length photographs of your favor. Plus, the lighting inside the aquarium is geared to give you great quality photos. There’s definitely no age limit in interacting with them! Kids and adults are welcome to socialize with these huge, friendly, and engaging mascots. See them every 12:30 and 14:30 and bring home a picture or two as a souvenir! The S.E.A. Aquarium starts opening at 10:00 until 19:00. However, expect that the place would not only be crowded by marine animals but more so with human beings! There seems to be no shortage of people who wish to tour the place every day. Plus, you can anticipate in sharing the oceanic view with visitors from all over the world! In purchasing the entrance fees, you can directly buy at the ticketing booth of the S.E.A. Aquarium. The corresponding prices, as of this writing, are listed below. Buy your S.E.A. Aquarium Singapore ticket online. Here’s why. If you wish to save more time and effort, then booking the ticket online is the best answer. You’ll save yourself from the storm of visitors queuing to buy their tickets. Clearly, you’re good to go as soon as you reach the place. No more waiting game! These online tickets also allow you enter the S.E.A. Aquarium with just your mobile phone. Upon entry, just present the printed or softcopy voucher, and ta-da―you’ll be inside the underwater world in no time. Less hassle and more time to explore the aquarium! Plus, purchasing online is actually way cheaper than buying at the ticketing booth. Compared to buying your ticket at the ticketing booth, online tickets are low-priced and open-dated. The online ticket remains valid for a few months, in contrast to over-the-counter tickets that are only valid for that particular day. Accordingly, you’ll not put your money into waste if you can’t go during the planned date. 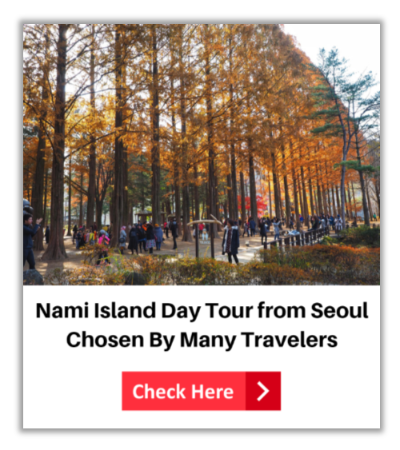 You can choose your preferred day of visit within the stipulated ticket dates, and even re-schedule your visit in case of sudden change of plans. Buy your S.E.A. Aquarium tickets online via Klook. The ease you’ll get by availing the ticket from Klook is quite remarkable. The website gives you the necessary details on the ticket, the trip, as well as the reviews made by previous visitors. Just make sure to check the validity of the online ticket through their website. Check S.E.A. Aquarium Ticket Discount Offers Now! The ticket for the S.E.A. aquarium lasts for the entire operating hours of the day, which makes your trip totally worth it. So, if you leave the S.E.A. Aquarium, it’s possible for you to still re-enter using a valid hand stamp. You may get one of these at the exit to ensure your re-entry. Both the ticket and the hand stamp will be needed upon entering back to the premises. 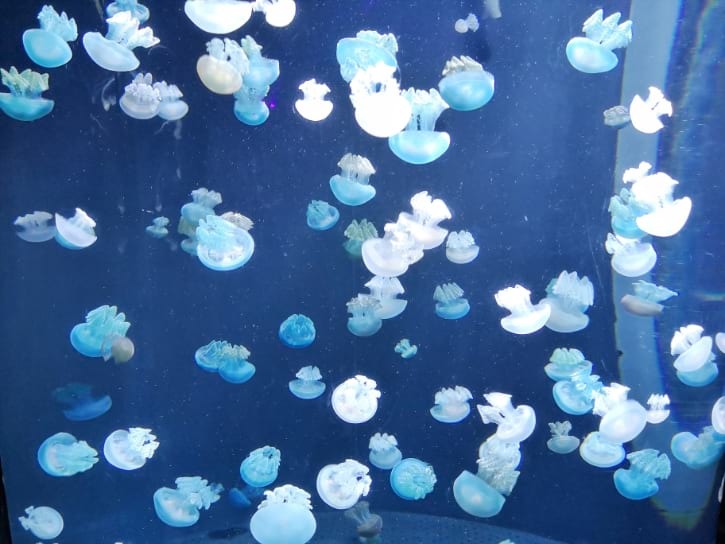 While you’re in the aquarium, you’ll be greeted by a crowd of swimming creatures and busy people. Chances are―you could get lost and waste your time going back to the same areas, even though there are a lot of signages to guide you. Still, to maximize your visiting time at your own service, you can opt to buy a Sim card, which comes with 100GB data. 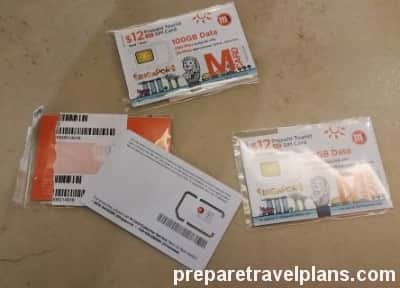 The 4G Sim Card is most recommended for tourists visiting Singapore. There are various locations that offer tourist Sim Card but you can have more convenience claiming yours at Changi Airport. Besides, upon arriving at the airport, you can just pin the pickup location without much effort. Upon claiming, you can easily activate it and enjoy its wide coverage and fast speed. 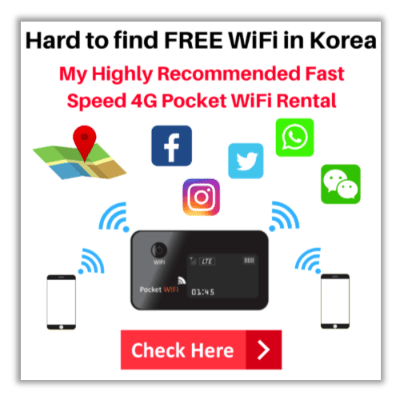 So, book your Singapore Sim Card online with Klook and communicate with ease. The Sim Card comes with free 500 minutes local calls as well as 20 minutes international calls, which is useful in connecting with your loved ones. 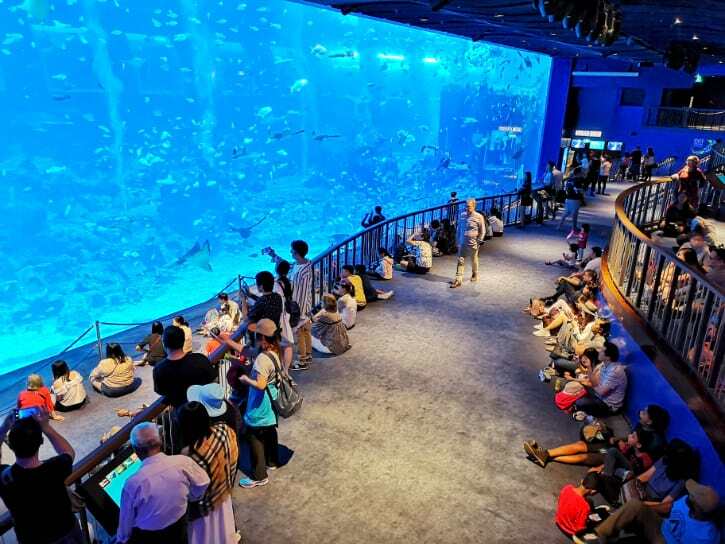 The card’s validity lasts for seven days, so it’s best to use it during your aquarium visit and for the rest of your Singapore trip. 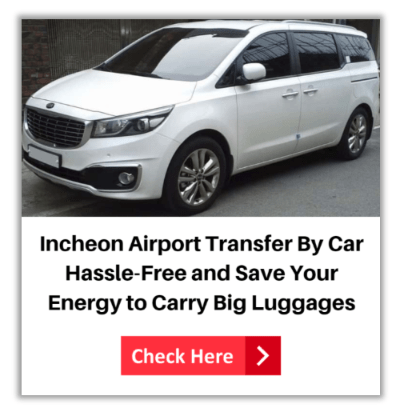 It’s also a convenient way to call and make reservations to the nearest hotels and tourist attractions before and after your trip. Check the Singapore SIM Card Discount Deals Now! Embrace the beauty of the information age! Other than taking and making calls, you can also use your Sim Card to connect to Google Maps. 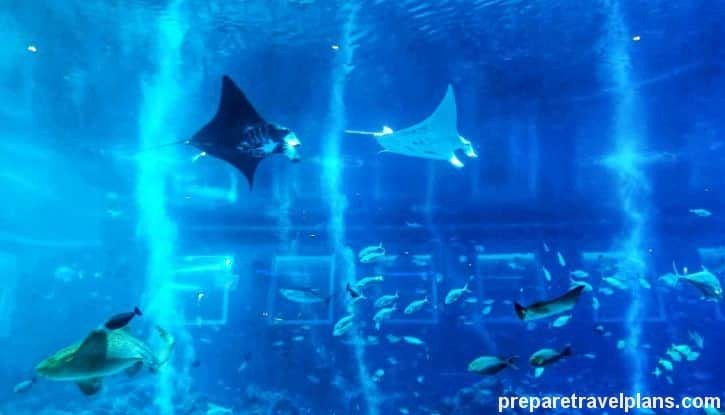 Through this, you can instantly track the location of the S.E.A Aquarium within Resorts World Sentosa at Sentosa Island. You’ll have more ease navigating and identifying which place you’re currently at. It will also help you to follow your own course and not be carried away by the crowd before you. On top of that, posting your photos on Instagram, Facebook, and Pinterest can be as speedy as the sharks’ with the help of the Sim Card! The aquarium’s free WIFI is accessible to each visitor so that you can update your social media in no time. How to get to S.E.A. Aquarium Singapore by MRT Train? The S.E.A. Aquarium Singapore is located in Sentosa Island. The nearest MRT Station to Sentosa Island is HarbourFront MRT Station. So, what you can do is taking the train to HarbourFront MRT Station via Circle Line or North East Line. Once you reach the HarbourFront MRT Station, you have 2 ways to go to S.E.A. 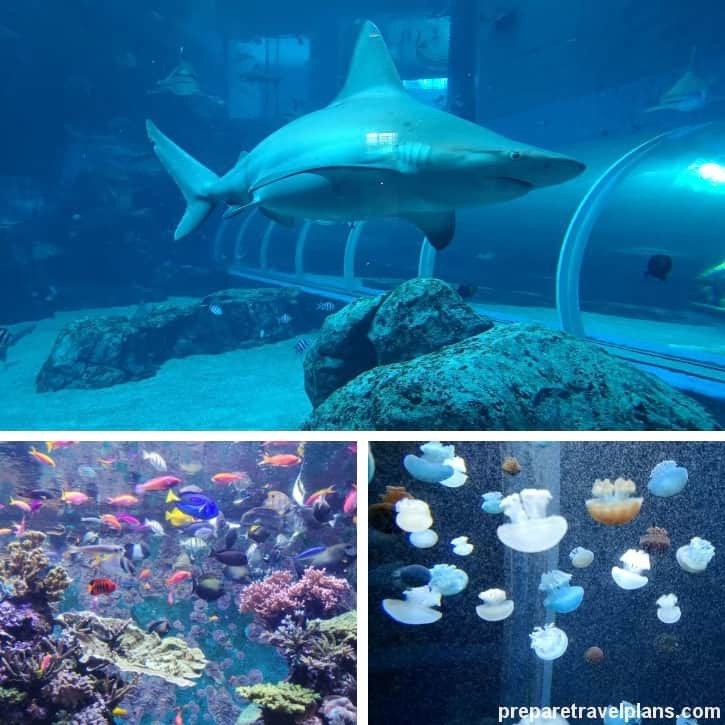 Aquarium Singapore with cheap price or free. I’ll cover 2 methods to go to S.E.A. Aquarium Singapore. So, you can pick one of the solutions given below to reach the S.E.A. Aquarium. Let’s start to see how to go there. After you reach the HarbourFront MRT Station, walk to Level 3 of VivoCity in order to get on the Sentosa Express Monorail. The monorail station is located at Level 3 of VivoCity for visitors to take Sentosa Express Monorail to S.E.A. 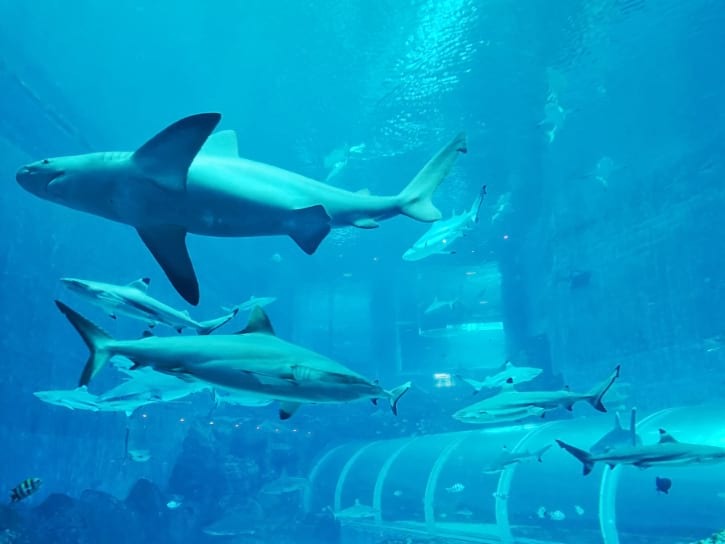 Aquarium Singapore and famous attractions in Sentosa Island like Universal Studios Singapore, Madame Tussauds Singapore, Wings Of Time and Skyline Luge & Skyride. VivoCity is a shopping mall and it’s connected to Harbourfront MRT Station to let you convenient walk to Sentosa Station for taking Sentosa Express Monorail. Let’s start to see in detailed at the below guide – how to get to S.E.A. Aquarium Singapore by Sentosa Express Monorail after alight at HarbourFront MRT Station. 1. Once you alight at HarbourFront MRT Station, look for Exit E. Follow the signpost for Sentosa Express. Go straight and up the staircases and then turn left. 2. After turned left, go up the escalator. 3. Continue up the escalator until you reach the Level 3. 4. Once you reach the Level 3, make a u-turn. 5. After make a u-turn, you will see the Sentosa Ticket Counter on ahead. You can buy the Sentosa Pass at the counter in order to get on the Sentosa Express Monorail. It cost SGD $4 per person. It already covered the entry fees to Sentosa Island. The Sentosa Pass can pay by cash, NETS and credit cards. You are completely free to take the Sentosa Express Monorail in Sentosa Island and even go back from Sentosa Island. If you have MRT Card, you can skip the queue to buy Sentosa Pass. You can directly use your MRT Card to access the Sentosa Express. 6. Scan your Sentosa Pass or MRT card at the boarding gate of Sentosa Station. 7. Board the Sentosa Express Monorail at Sentosa Station. 8. Get off at Waterfront Station and then go down the escalator. 9. After went down the escalator, follow the signboard for S.E.A. Aquarium. 10. Continue straight until you see the water fountain. 11. Keep left lane and then go straight on at the water fountain. 12. You will see the signpost for S.E.A. Aquarium again. Follow the signpost instruction, continue straight and pass the Candylicious store (Selling Chocolates and Candies) on your left. 13. Continue along the walking trail. 14. Pass the Din Tai Fung restaurant on your left then turn left. 15. Now, you will spot the S.E.A. Aquarium on ahead. Keep right you will find the S.E.A. Aquarium ticket booth. 16. You will see the ticket booth on your right where you can buy the S.E.A. Aquarium ticket at here. If you want to avoid the long waiting lines to buy tickets, you can buy the tickets online. So, you can enter the S.E.A. Aquarium directly by showing your printed or soft-copy ticket. Simple and skip the long queues especially peak season and school holidays. In addition, you can get cheaper rate if you purchase the tickets online. If you like to know what previous visitors got to say about S.E.A. 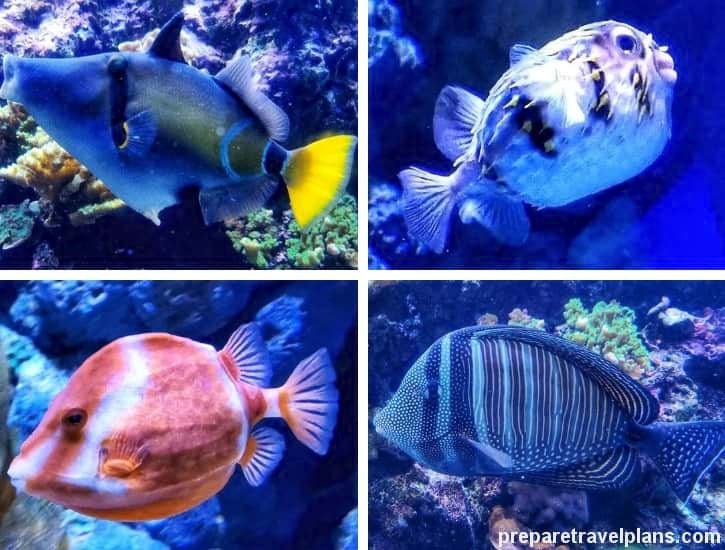 Aquarium and why they prefer booking online, check the below link to find out more. Check S.E.A. Aquarium Discount Ticket Deals Now! 17. Line-up to enter the S.E.A. Aquarium Singapore. Another solution is you can walk to S.E.A. Aquarium Singapore via Sentosa Boardwalk. When you reach the HarbourFront MRT Station, walk to Level 1 of VivoCity in order to access the Sentosa Boardwalk. Actually, Sentosa Boardwalk is a pedestrian walkway like a bridge that’s connected between VivoCity and Sentosa Island. Convenient for people walking to Sentosa Island. Now, let’s focus in detailed at the below guide – how to walk to the S.E.A. Aquarium Singapore via Sentosa Boardwalk after get off at HarbourFront MRT Station. 1. After you get off at HarbourFront MRT Station, take Exit E. Follow the signs to the Sentosa Boardwalk. Walk straight and go up the staircases, then turn left. 2. After turned left, go up the escalator to Level 1 in VivoCity. 3. After went up the escalator, keep on the left lane and continue straight. 4. Soon, you will see the signpost for The Promenade Sentosa Boardwalk on ahead. Follow the sign. 5. Go straight on until you get to the cross-junction. At the cross-junction turn left. 6. Continue straight ahead, you will discover another signboard of The Promenade Sentosa Boardwalk with arrow that pointing go straight. 8. Soon, you’ll find The Promenade Sentosa Boardwalk signboard on ahead. Walk out the glass door and then keep on the left-lane. 9. Now, you’ll find the pedestrian walkway connected to the Sentosa Island which they called it as Sentosa Boardwalk. Slight left and then go straight ahead. 10. You will see the signboard of Sentosa Boardwalk on your left as you walk toward the pedestrian walkway (Sentosa Boardwalk). 11. Now, you’re located in Sentosa Boardwalk. Walk straight on and you only have 545 meter away from Sentosa Island. The Sentosa Boardwalk is installed by moving walkways in order to reduce your walking steps. 12. Continue straight, you only have 120 meter away from Sentosa Island. 13. Once you reach the Sentosa Island, you will see the ticket counter on your left-hand side. Grab the Sentosa Island map at there to help you easy to navigate around in Sentosa Island. 14. Continue along this walking trail. 15. Turn right after the entry gate. 16. After turned right at the entry gate, you will discover the signpost for S.E.A. Aquarium. Follow the instruction given by the signpost for S.E.A. Aquarium. It will lead you to the aquarium. 17. Stay on the right-lane. 18. Go straight, you will see the staircases on your left soon. 19. Go up the staircases when you see the it on your left. 20. Next, you will spot the S.E.A. Aquarium building on your right. Go toward that direction. 21. Line-up to buy your S.E.A. Aquarium tickets at the ticket booth here. Another way is booking your aquarium tickets online, so that you can skip the long queue. In addition, purchasing tickets online is cheaper than you buy at the ticket booth. Want to know what previous visitors feedback on S.E.A. 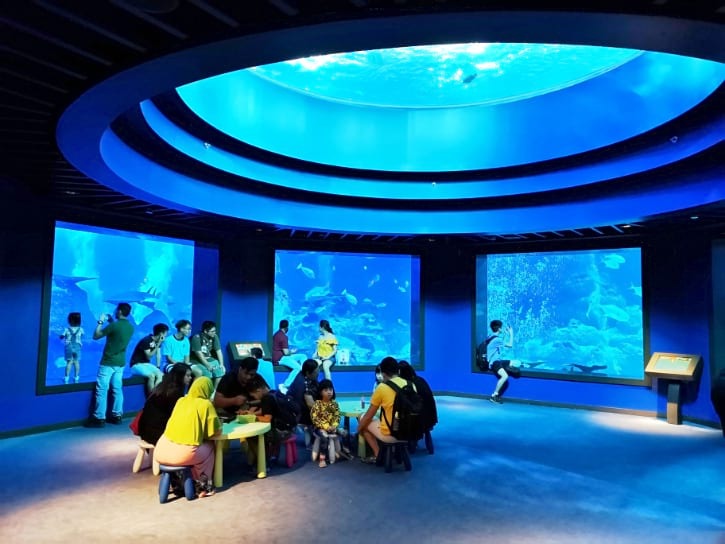 Aquarium Singapore and why they want to buy tickets online? You can know it via below link. Check S.E.A. Aquarium Discount Ticket Offers Now! 22. After bought the S.E.A. Aquarium tickets, go straight to prepare line-up to enter the aquarium. 23. Queue up to enter S.E.A. Aquarium. 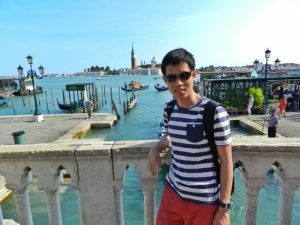 In a nutshell, a visit to Sentosa Island’s S.E.A. 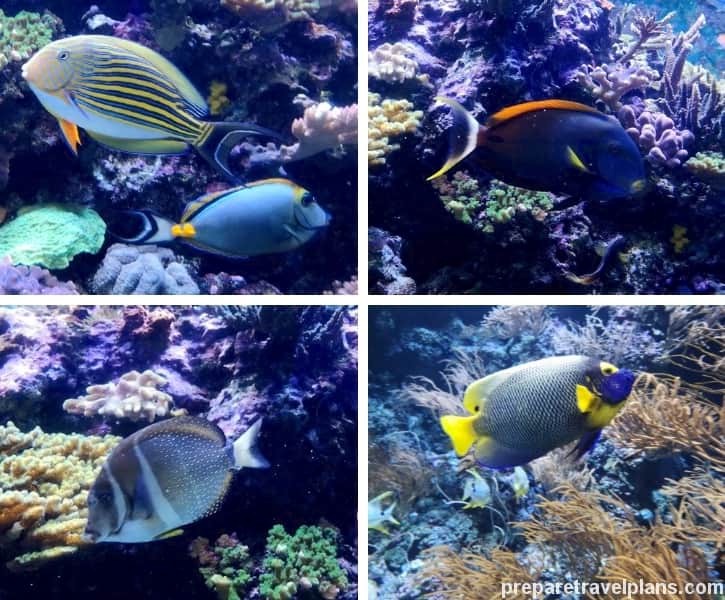 Aquarium is an experience that will last not just in photos but in memory! Sure, you can visit any ocean to see different water creatures, but this one is different. With S.E.A. Aquarium, you’re bound to lock eyes with various marine animals of different species, all in one day. No need to be a diver to see these breathtakingly beautiful sea creatures! If you’re still contemplating whether to go or not to go, let’s list down the reasons why the S.E.A. 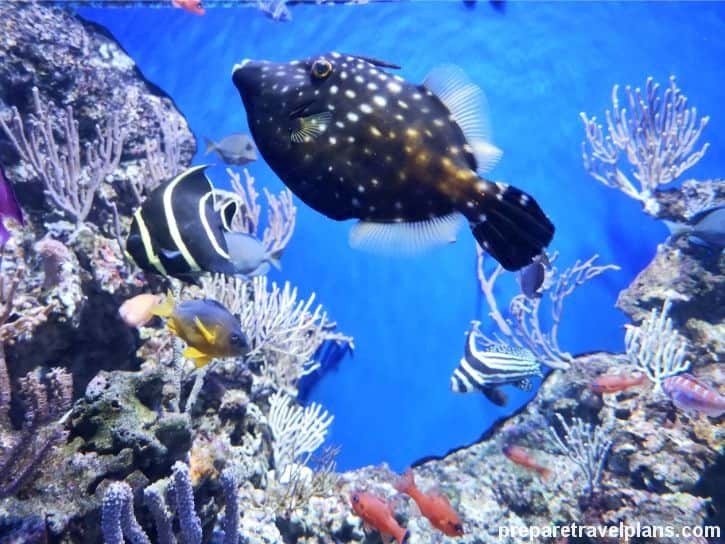 Aquarium is an awesome destination for your next vacation. 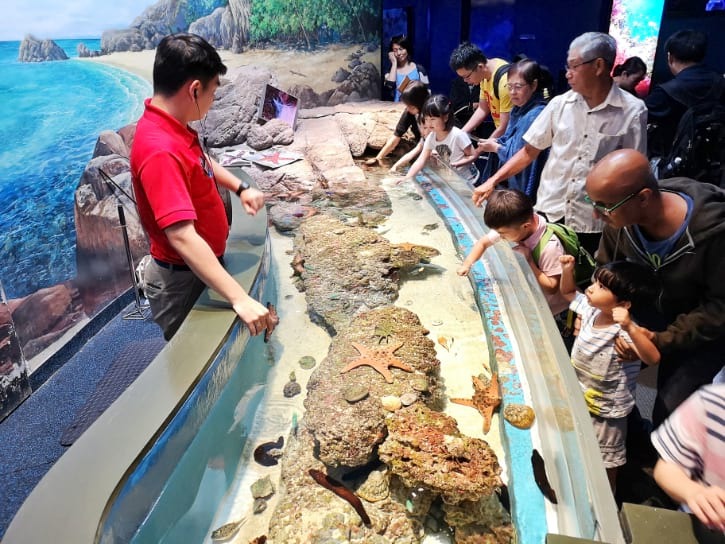 The aquarium itself is located at the beautiful Sentosa Island, which is highly accessible by public transport, either MRT Train or Sentosa Express. Visiting the aquarium is made more convenient and comfortable with the help of online ticket options and 4G Sim Card availability. Your presence will be graced by more than 1,000 aquatic species across 50 habitats! 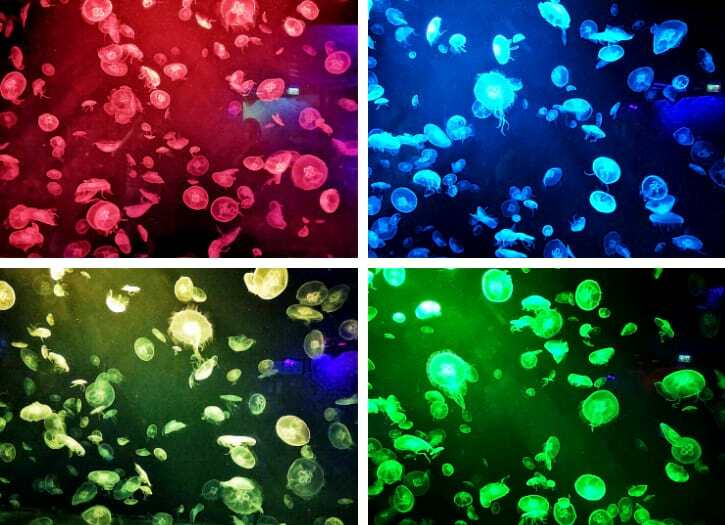 You’ll leave with the best pictures because of the aquarium’s best lighting! You’ll encounter distinct-looking water animals you haven’t seen before. You’ll be enlightened, entertained, and educated―all at the same time! Learning more about the ocean realm and its underwater charm is guaranteed. The possibility of meeting similar-minded people who have the same love for marine life as you do is relatively high. Every penny is worth the time and the experience you get. Surely, the mesmerizing activities of the water creatures will leave you gasping with utter excitement from time to time. See for yourself and uncover the wonders of the waters! 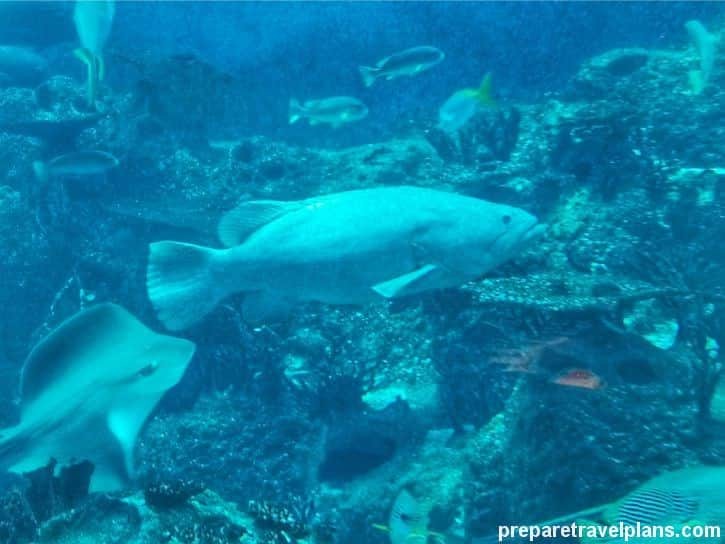 Touring around the underwater world in Singapore is like seeing the entire ocean in one glorious stroll!